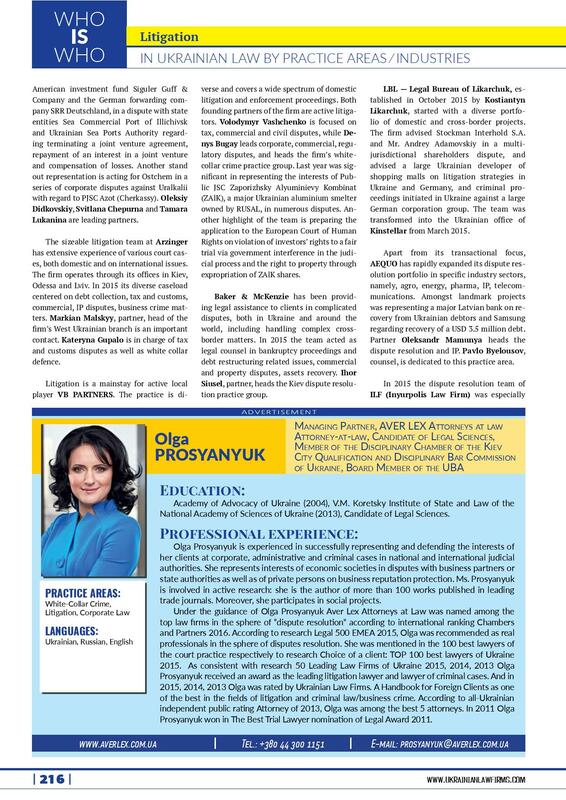 All major practices of attorneys at law "BOGATYR & Partners'', namely civil and criminal litigation and investigations that involve international and transnational matters, fraud claims, white collar matters, assets tracing, arbitration, international criminal charges and those who are subject to economic sanctions, post M&A disputes, partnership and joint venture disputes and also provision of advice on contractual and insolvency matters as well as issues relating to the enforcement and recognition of judgements in Ukraine and abroad , received high grading from the annual rating research «Ukrainian Law Firms 2016. 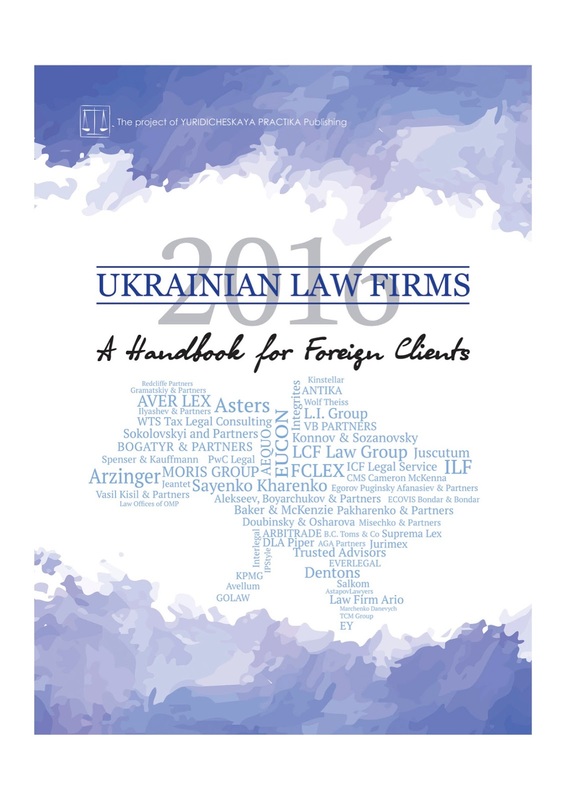 A Handbook for Foreign Clients». 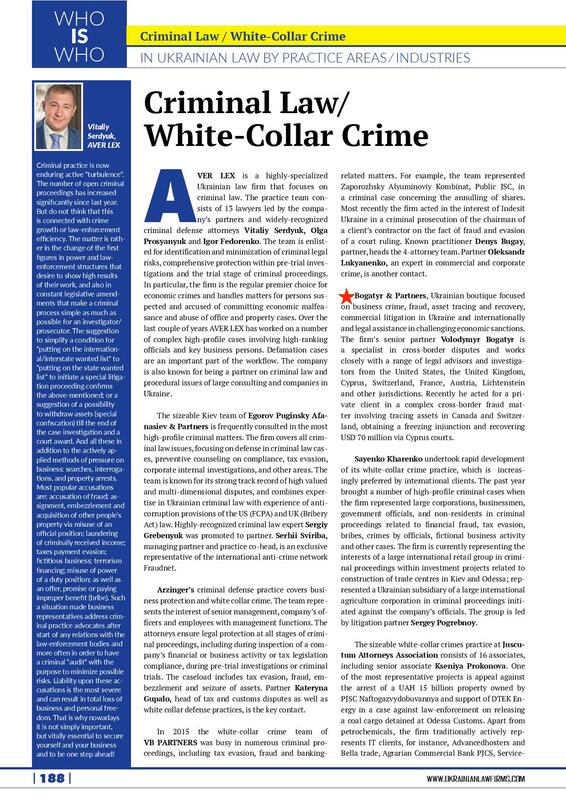 As a leading individual in Criminal Law/ White-Collar Crime, Litigation. 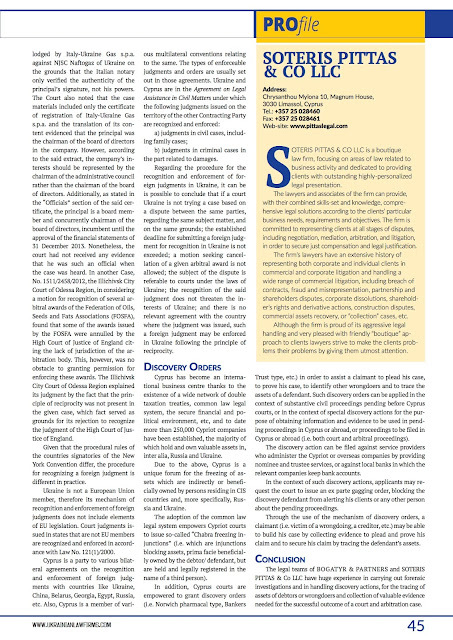 The success of any litigation and arbitration case depends mostly on the capability of the plaintiff to trace and locate sufficient assets of the defendant’s debtor to block and freeze the same as security for the satisfaction of any court decision or arbitral award to be issued in the main court or arbitral proceedings. 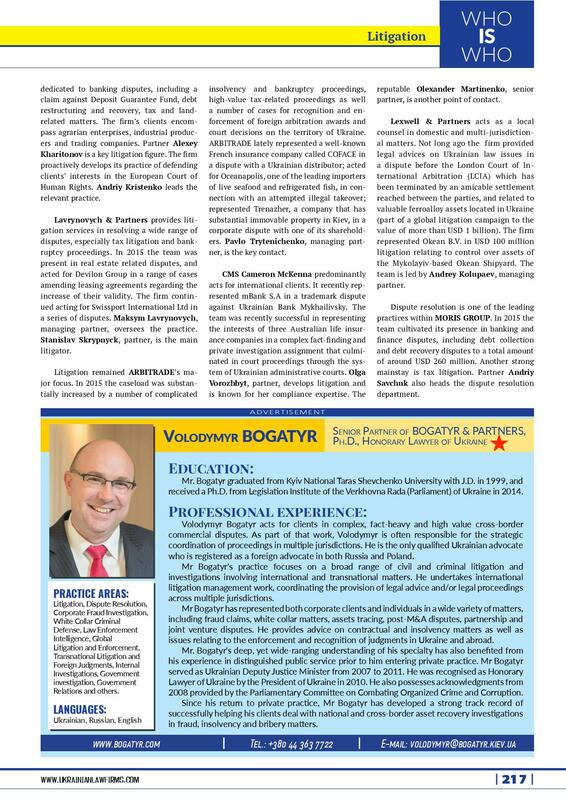 The legal teams of BOGATYR & PARTNERS and SOTERIS PITTAS & Co LLC use the services of their corporate investigators and forensic specialists to trace and identify hidden assets around the world. In ling a motion, the issue of confirmation of the movant’s powers deserves special notice. The Shevchenkivskyi District Court of Kiev dismissed without prejudice a motion led by a representative of Italy-Ukraine Gas s.p.a. in Case No. 761/38433/15-Ц and seeking recognition of the award issued by the Arbitration Institute of the Stockholm Chamber of Commerce, of 19 December 2012, in Arbitration Case No. 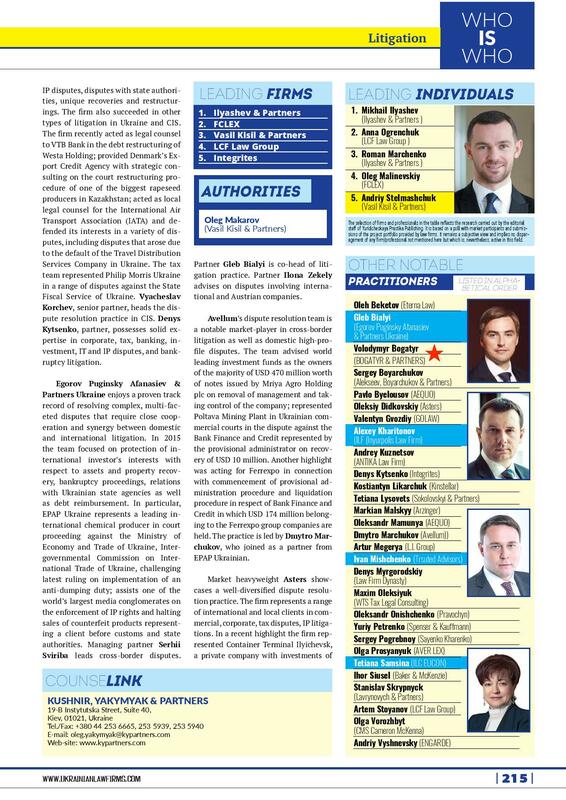 V007/2008 based on the claim lodged by Italy-Ukraine Gas s.p.a. against NJSC Naftogaz of Ukraine on the grounds that the Italian notary only verified the authenticity of the principal’s signature, not his powers. The Court also noted that the case materials included only the certificate of registration of Italy-Ukraine Gas s.p.a. and the translation of its content evidenced that the principal was the chairman of the board of directors in the company. However, according to the said extract, the company’s interests should be represented by the chairman of the administrative council rather than the chairman of the board of directors. Additionally, as stated in the “Officials” section of the said certificate, the principal is a board member and concurrently chairman of the board of directors, incumbent until the approval of the financial statements of 31 December 2013. Nonetheless, the court had not received any evidence that he was such an of cial when the case was heard. In another Case, No. 1511/2458/2012, the Illichivsk City Court of Odessa Region, in considering a motion for recognition of several arbitral awards of the Federation of Oils, Seeds and Fats Associations (FOSFA), found that some of the awards issued by the FOSFA were annulled by the High Court of Justice of England citing the lack of jurisdiction of the arbitration body. This, however, was no obstacle to granting permission for enforcing these awards. 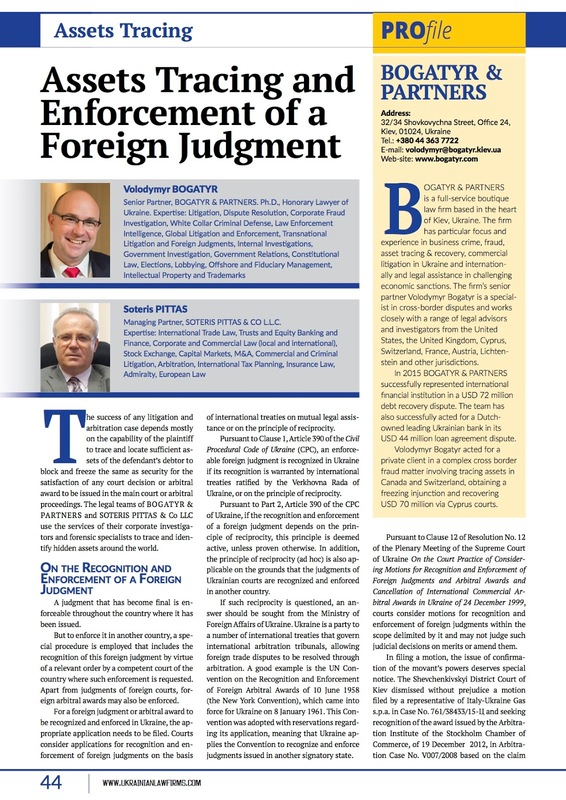 The Illichivsk City Court of Odessa Region explained its judgment by the fact that the principle of reciprocity was not present in the given case, which fact served as grounds for its rejection to recognize the judgment of the High Court of Justice of England. 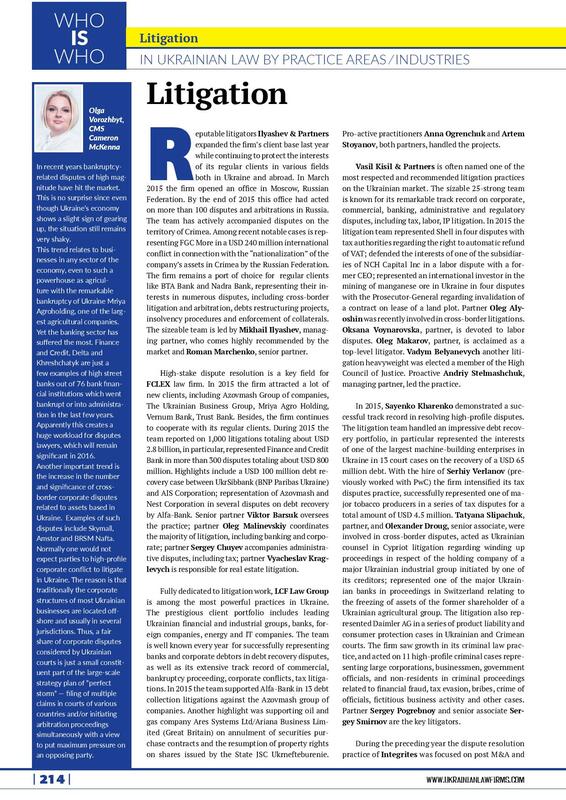 Ukraine is not a European Union member, therefore its mechanism of recognition and enforcement of foreign judgments does not include elements of EU legislation. Court judgments issued in states that are not EU members are recognized and enforced in accordance with Law No. 121(1)/2000. Regarding the procedure for the recognition and enforcement of foreign judgments in Ukraine, it can be is possible to conclude that if a court Ukraine is not trying a case based on a dispute between the same parties, regarding the same subject matter, and on the same grounds; the established deadline for submitting a foreign judgment for recognition in Ukraine is not exceeded; a motion seeking cancellation of a given arbitral award is not allowed; the subject of the dispute is referable to courts under the laws of Ukraine; the recognition of the said judgment does not threaten the interests of Ukraine; and there is no relevant agreement with the country where the judgment was issued, such a foreign judgment may be enforced in Ukraine following the principle of reciprocity. The adoption of the common law legal system empowers Cypriot courts to issue so-called “Chabra freezing injunctions” (i.e. which are injunctions blocking assets, prima facie beneficially owned by the debtor/ defendant, but are held and legally registered in the name of a third person). The discovery action can be led against service providers who administer the Cypriot or overseas companies by providing nominee and trustee services, or against local banks in which the relevant companies keep bank accounts. 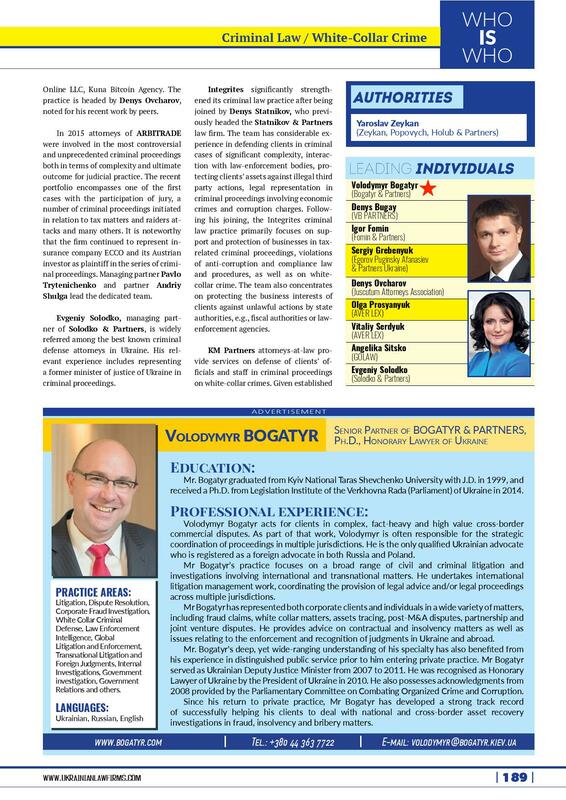 The legal teams of BOGATYR & PARTNERS and SOTERIS PITTAS & Co LLC have huge experience in carrying out forensic investigations and in handling discovery actions, for the tracing of assets of debtors or wrongdoers and collection of valuable evidence needed for the successful outcome of a court and arbitration case.